Maria is upset that Max has fought with Robert. Shane is on Max's side. Julie is happy going out with Philip. Jim tells Helen that since Phil is married, he thinks Julie will get hurt. Loretta and Julie have a fight at Phil's flat. Luckily, Phil comes in and breaks it up. He takes Loretta back to the clinic. Julie is very upset. 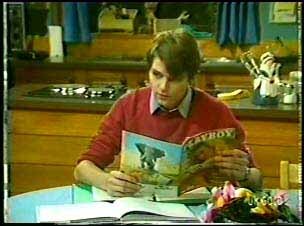 Danny suggests he and Wendy go out tomorrow night but Wendy says she can't take Danny away from his homework. They agree to go out later in the week. Phil comes in and hugs Julie, asking her if she's alright. She clearly isn't alright, but glad that Phil arrived when he did. Phil says that the clinic have calmed Loretta down and the children are with a neighbour so they're OK.
Phil says he can't let this go on - it's not so bad when she's just threatening him, but now she's threatening Julie and the kids too. Phil resolves to get the kids to live with him and apply for custody. Phil says he will have to try to help Loretta too - she's a sick woman and she is still his wife. Julie promises to stand by him and do anything she can to help. PHIL: Look...when this is all over...I want you to marry me. PHIL: If you'll have me, of course. JULIE: (beaming) Engaged. Isn't it wonderful. By the look on Jim's face he doesn't think it's wonderful at all! Julie explains that they'll get engaged after Phil has sorted him wife out. She says that Phil loves her and it's only a matter of time until his divorce comes through. Jim urges her to think about it carefully. Helen is a bit more positive and says she hopes it will all work out. When Julie has gone, Jim is pretty shell-shocked, saying he'd have thought they'd wait until after Phil was divorced. He doesn't like it at all. Julie is on cloud nine and chatting to Des. Des observes that Julie's moods have been like a yo-yo this last week. She won't tell him her secret though. Helen is painting when Scott comes in. He takes about Wendy, saying she's a great girl. He heads off to see Dpahne. When Scott has gone, the phone rings and it's Wendy. Helen explains that Scott has gone over to see Daphne, and then to the Coffee Shop. Wendy hears Danny coming so she quickly says goodbye. Daphne and Scott are chatting about Wendy. Scott explains that Wendy is his girlfriend and she's great. He says it'll be different than it was with Kim. Daphne advises Scott always to think twice, and think again. Wendy and Scott have their arms round each other. Then they kiss. Danny comes out and sees this, and wrestles Scott to the ground. Scott is about to punch Danny, but Daphne runs out and breaks up the fight. Scott and Danny go off home, leaving Daphne to give Wendy a piece of her mind. DAPHNE: You really enjoyed that, didn't you? Daphne tells Wendy off for turning Scott and Danny into enemies. Wendy says she doesn't care - Scott and Danny are just little kids. Daphne tells her off and calls her a spoilt brat. Wendy turns nasty and casts aspertions on Daphne's stripping history. She stalks off. Marilyn is suspicious that something is going on between Julie and Phil. Des takes this calmly and says that Julie is very secretive - for all he knows she might have another bloke. Marilyn doesn't think that's the case. Julie and Phil are talking in a corner, arranging to go out to a restaurant for dinner. She suggests just having dinner at his place again. Phil says he'll cook. When Julie comes back, Des is looking at a sheet of paper with a drawing of some clothes on it. DES: Planning on getting married, are we? Wendy comes in in a bit of a strop. Danny goes on about wanting to protect Wendy, but she's not very impressed. She says that Danny shouldn't be fighting. She refuses to go out with Danny tonight, saying she's going out. Danny guesses she's going out with Scott, and eventually Wendy confirms it. Danny is confused, saying he thought Wendy was his girl. She says she'd rather go out with Scott because he acts more grown-up! Scott is waiting on tables wearing a strange poncho-type tunic, so I guess it must be Mexican night again. Wendy comes in, but Scott is running late. 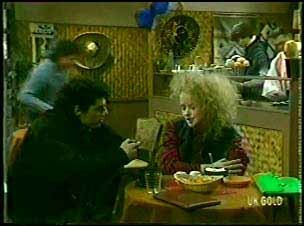 A bloke in the cafe comes over and says he recognises Wendy. He sits down with her. Scott comes over and Wendy introduces the guy as an "old friend". Phil and Julie have finshed their meals and are having a post-dinner drink. Phil says that he called in to see Loretta earlier. They had quite a chat about the divorce and it was quite a civilised conversation - apparently she readily agreed to a divorce. Julie is surprised at this, but pleased. Phil assures Julie that everything is going to be fine. 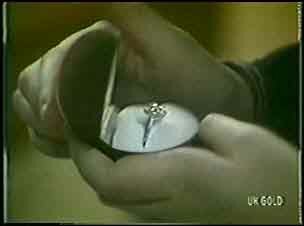 Phil gets a ring out of his pocket and present it to Julie. She's chuffed and puts it on her right ring finger. Phil promises her that it won't be long until they're engaged. PHIL: How about a toast, eh? To the future Mrs Martin. To you. Wendy is chatting to the bloke - apparently he's a friend of a friend who's tracked her down. Scott is still busy. Wendy says that Scott is not her boyfriend, just the kid next door. The bloke tells her he's going up north tomorrow. Wendy says she might go home herself tomorrow and they discuss meeting up en route! Scott tells the manager that he needs to go soon to go on his date with Wendy. The manager says he'd better think again - Wendy has gone. And so she has, and the bloke has gone too.